It's such a drag waiting around, after you fold, for other players to complete their hands. That's why I like the new speed poker phenomenon that's sweeping the online poker world these days. 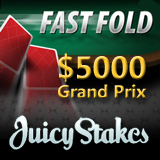 Juicy Stakes online poker has just joined the speed poker revolution launching its new Fast Fold Poker. Fast Fold lets online poker players play more hands, and more games, and see more action than ever before. Juicy Stakes' new management really want us to try this new game format so, starting Monday, they're hosting two two-week rake races and giving away some nice prize money! $5000 will be awarded to players with the most raked hands during that period. The race is for the most raked hands and not for the value of rakes. One raked hand is a hand that was raked with a minimum of €0.01/$0.01. Hands with no flop are not raked. It’s no wonder the Fast Fold phenomenon has spread so quickly. It’s the new way to play ring games. Fast Fold deals a new hand as soon as a player folds. They’re instantly moved to a new table, with new opponents, where they’re dealt a new hand almost immediately. Real adrenalin junkies can multi-table Fast Fold games like regular ring games. Fast Fold tables are listed under the Poker tab and players can join up to three at a time. Juicy Stakes recently announced that it has increased its weekly Sunday Guaranteed poker tournament to $17,500. $125 + $9 buys a seat in the popular Sunday event but players can also qualify through satellites. Daily satellite tournaments are listed on the Tournaments tab in the poker software.